Video clip synopsis – The Bangladeshi writer Taslima Nasrin recounts her 1960s childhood and her awakening to women's oppression. Broadband MP4 taslima_bb.mp4 (10.8MB), suitable for iPods and computer downloads. Taslima Nasrin reflects that she has come to the view that women are oppressed everywhere, to a greater or lesser degree. She reminisces that she had previously neglected to see her mother’s qualities and problems. Taslima explains that she must continue to write: “It’s a good feeling to write” and to dream of Utopia. 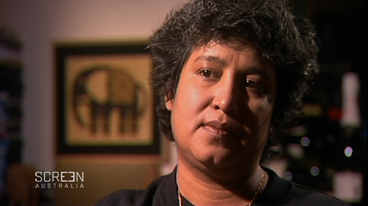 Taslima Nasrin – Bangladeshi doctor, poet and refugee is an excerpt from the documentary The Price of Freedom an episode of the four part series entitled Fearless – Stories from Asian Women, produced in 2001. Fearless – Stories from Asian Women is a Film Australia National Interest Program in association with Mask Productions. Produced and developed with the assistance of ScreenWest and the Lotteries Commission of Western Australia. Produced in association with SBS Independent. Teachers should note that the video clip ‘may offend religious sensibilities’. However, it will assist students to understand Asia, to develop informed attitudes and values, to know about contemporary and traditional Asia, and to connect Australia and Bangladesh (National Statement for Engaging Students with the Studies of Asia). In the 1990s Taslima Nasrin had to leave her birth country, Bangladesh, because her poetry and speeches criticised religion’s oppression of women, including oppression by ‘folk’ Islam. She currently lives in exile in Sweden. Where in Asia is Bangladesh located? What climate would this country have compared to Sweden and/or Australia? How might this difference affect Taslima? How does Taslima describe her childhood compared to her brothers’ childhood? In your family, are the educational goals different according to the gender of the children? Explain with examples. Does Australia have a Bangladeshi migrant population? If so, what is their story? Which childhood talent shaped Taslima’s destiny? Was this talent recognised and valued by her family? Can you name some Australian writers who used a male pseudonym in order to get published in the early 1900s? Create a profile of Taslima – include her year and country of birth, childhood, qualifications, work experience, skills, court experiences, personality, beliefs and values. You might like to visit her website and read some of her poems to include in the profile. You may find the poems arguing for great cultural change. Think about whether Taslima’s words are literal or metaphorical in meaning. Whilst we learn that Taslima feels damaged by her country’s dominant religion and interpretation of gender roles, we can see that she values other aspects of Bangladeshi culture. What evidence can we see of this in her home in Sweden? Research Salman Rushdie. Who is he and what happened to him after he wrote a book called The Satanic Verses? Why is Taslima sometimes described as the female Salman Rushdie? What does the phrase ‘free speech’ mean? How free is speech in Australia? Has this always been so? Research current laws about defamation, slander and hate speech/vilification. Look at the Australian Government’s Department of Immigration and Citizenship website, Click on ‘Five Fundamental Freedoms’. Create an information poster/webpage. Investigate the case of Australian writer, Harry Nicolaides, who was sentenced to three years jail in Thailand in January, 2009, for offending the law of ‘lese majeste’ in his novel. (See The Age Editorial, 21 January 2009 Can Canberra catch the conscience of the king?). From which legal culture does the ‘lese majeste’ law originate and what is it? Investigate the brief history of the communist party in Australia. When was it illegal in Australia to be a member of this political party and to participate in its activities? Did this ban also include the writing of articles? Why did the government fear this group and its ideas at the time? Investigate the 2008 World Youth Congress with the Pope in Sydney, Australia, and the NSW government’s ban on protest groups. Why did the congress organisers fear criticism of the Catholic church? Currently, is there censorship of any particular views or beliefs in Australia? Look at the laws about terrorism and look at the controversy about advertisements run by the Atheist Foundation of Australia. What is your opinion about such censorship? Naheed, K, 1997, I am not that woman, in Dimensions by Bott, Grafton, Millard, Trevaskis, Curriculum Corporation, Melbourne.